I was fortunate enough to receive an invitation for an advanced briefing on Polycom’s big announcement celebrating their 25th anniversary with a few brand new solutions. I started the day by chatting with Polycom EVP of WW Engineering, Michael Frendo, who was immediately speaking my language. He assured me that while the team was very proud of the specs and feature sets of the products I was about to see, the focus was going to be on actual user applications and workflow. In today’s collaboration market, this is the clearest path to success. Customers today are a lot less impressed by “cool toys” and a lot more concerned about hosting productive working sessions with remote-based teams. While there were a number of new solutions I saw yesterday, the highlights were three new products in particular, each culminating from years of internal development. These are the Polycom RealPresence Trio, Debut, and Centro. The Polycom team is extremely proud of these products, with good reason. The products themselves are an interesting mixture of building upon existing successful Polycom lines as well as some completely new and unexpected features and dynamics. 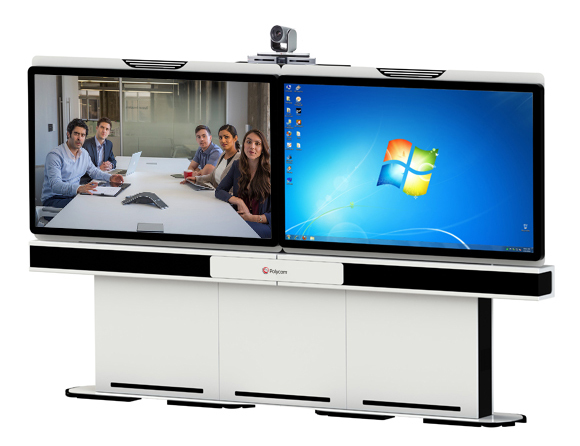 All of them are designed to address what Polycom is calling “The Workplace of The Future“. 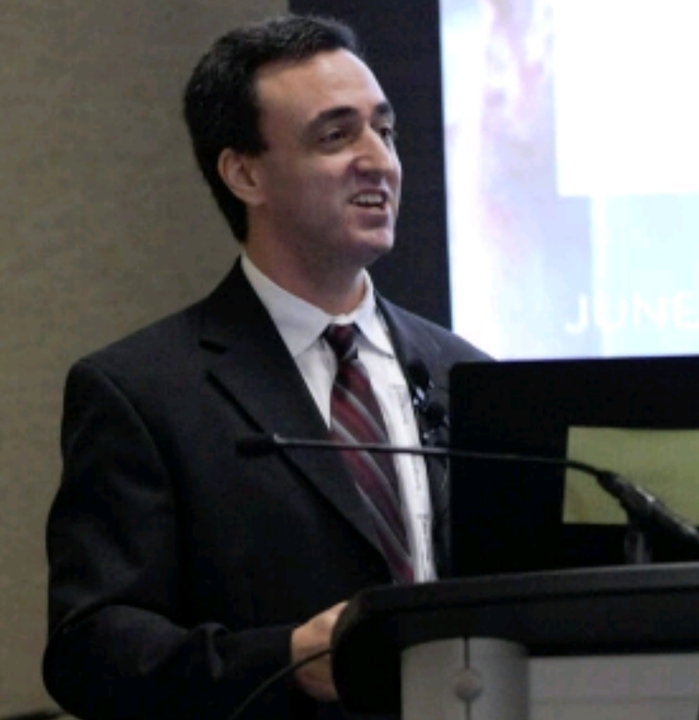 After a brief intro by CEO Peter Leav (shown above) and EVP/CMO Jim Kruger, and a hat tip to legendary co-founder Jeffrey Rodman, the new products were shared by Michael Frendo and Ashan Willy (SVP WW Systems Engineering & Product Management). Let’s take a look at the new products in turn. It is generally an unwise move in this industry to try and pick winners, but the Polycom Trio is such a no-brainer that I feel comfortable predicting that it will be a success. It takes a known winning formula and adds highly sought after functionality, while keeping it all user friendly. The Polycom “starfish” conference phone has been one of the most ubiquitous and popular appliances in the history of business meeting room collaboration. When remote collaboration was all about audio, it completely took care of our of meeting room communication needs. Today however, we expect a lot more than audio communication in a team workspace. Generally, the answer has been to supplement the Polycom conference phone with additional tools to handle video and content share. Multiple tools with multiple interfaces for users to learn adds complexity and confusion to any environment. It would greatly simplify things if the hub of the room, the conference phone itself, could completely support and control all meeting and collaboration elements. That is the goal and purpose of the Polycom RealPresence Trio. While having one appliance handle voice, content, and video may not be an original concept; using one of the most popular conference phones on the planet as the platform is certainly compelling. An “Apple-esq” touch user interface makes it easy to start a meeting (audio or video), particularly if you leverage the calendar integration for “one-touch” meeting startup. The device is paired wirelessly to a small component connected to your meeting room monitor and video camera (the demo used a typical Logitech webcam). This allows local users to wirelessly share content from their personal devices, as well as supporting video calls over your choice of video platform, whether it be cloud or hardware-based. As expected with any Polycom solution, the integration with RealPresence, Skype for Business, and Broadsoft is particularly tight. After participating in a few demo calls, I quickly saw the advantages from a workflow perspective. One, easy to use, touch interface to control everything is clearly superior to multiple confusing remote controls. Having everything accessible from the speakerphone in the center of the table is clearly preferable to expecting users to leave the table and walk over to an appliance on a wall or shelf in order to share content or collaborate. Finally, despite the fact that no one complains about Polycom’s audio quality, they found a way to notably improve it with this device. The Trio has bass! One limiting factor of speakerphones is the lack of bass, as subwoofers traditionally required a bigger box than we would want to have on our meeting room tables. With today’s audio technology, we can produce big bass from a small package. The result is that remote participants no longer have that “tinny” or distant sound. They sound a lot more like they are in the room. Bottom line, I don’t think it would be presumptuous of Polycom to plan on manufacturing a lot of these, as I expect they will be received very well by their customer base. But don’t let its slim appearance and ease of use (plug-and-play setup, no IT support required) fool you. This is a full featured, enterprise grade, video system. The internal PTZ camera is 1080p, and it has Polycom’s leading audio functionality, including their “NoiseBlock” technology, which impressively eliminates common audio distractions such as keyboard tapping and paper rustling. Although I do not have pricing as we go to press with this story, my understanding is that this is being geared towards the huddle room, not the boardroom, and I expect it will be priced accordingly. If the only announcement today was the Debut, I would have been very pleased, as it is exactly what I want from a Polycom video endpoint in 2015. It is somewhat unfortunate that the particular benefits and value of this product may get a bit lost in shuffle today among the excitement I expect to surround the complete “newness” of the Trio workspace dynamic, and the buzz and controversy I expect over our next product. Are you ready for something completely different? While I certainly didn’t anticipate the Trio and Debut, they are both logical extensions and evolutions of existing technologies. So I may have been surprised, but I wasn’t completely taken off guard. The Centro is another story altogether. This is so new and different that I expect the analyst community may take a while to warm up to it and it may generate some controversy. In fact, I was a bit dubious myself when I first saw it. It is just so different than anything we have seen before in the video collaboration space. What the heck is Polycom up to here? They want us to sit around four large touch displays and have a meeting? But then I participated in an actual Centro call and it all clicked. Sitting in a circle is a natural meeting dynamic (the briefing included a lot of references to campfires and other circle based groupings). The ability to sit in a working circle and talk face to face with remote participants, without craning your neck to look up at a wall, offers a number of benefits. One primary benefit is the elevation of remote participants from second class citizens. It often feels as if the people in the room are the “real” meeting participants, the “real” members of the working team, while remote participants are more like observers hanging up on the wall. While remote participants in traditional video meetings can certainly contribute to the discussion, it is a bit harder to get everyone’s face-to-face attention when local participants have to look away from the table, and up at the wall, to see you. When I was in a Centro call, I was sitting on a couch as one would typically see in a corner workspace of an open floor office design. The Centro was right in front of me, with the other local participants circled on couches around it. Whether I was talking with remote participants via the Centro or with people actually in the room, I sat normally and looked forward. As a result, it felt less different to talk to the remote people. Obviously, there are still differences between local and remote people, even with the Centro. For example, I see local people in three dimensions and remote people in only two. But the Centro does greatly lessen the “second class” status of remote participants by bringing them into the circle. The amount of detail put into the design of this appliance is impressive and beyond the scope of this write-up. However, I can share a few examples to give a sense of the amount of development that went into this product. Some of them may seem like minor points, but collectively they show that Polycom put a great deal of thought behind every inch of the Centro. For example, the indicator lights under the unit (red, green, blue to show mute, in call, and out of call status) glow brightly when status changes to ensure you notice the change, then fade to a softer glow so the status is still available, but not distracting. I learned that the specific levels of brightness and fade were the result of days and days of testing to tune it in perfectly. Another example is how the stitching between the 5 lenses in the central 360 camera is so well done that it was impossible to find the “seam” even when a remote participant put his face directly between two of the lenses. Other examples include how the camera retracts during local meetings (to make video newbies more comfortable) and how the layout of remote participants on screen dynamically changes to capture the active speaker, whether sitting, standing or even walking around the room. A perfect example of how Polycom really took user behavior into mind is the USB charger ports on the base (right under the clock, which is another nice touch). When I first saw the USB ports, I assumed they were for IT people to connect laptops to configure the device. I was wrong, the Centro is plug-and-play (two cables and you are connected and provisioned), so these ports are purely to let users charge their mobile devices. Polycom realized that the first thing people do when they settle down on couches in a corner workspace is to look for outlets to charge their phones. Putting USB charger ports into the Centro will make them very happy. Again, a seemingly minor design choice, but evidence that Polycom designed the Centro around user behavior, rather than expecting users to adjust to the Centro. Since this is the first of its kind, it is impossible to predict its success. Again, I do not yet have pricing, which may be a factor. Also, this may be a product that people need to experience in order to really “get it” which was the case with me. But I definitely think Polycom is onto something with this circular meeting dynamic and I love the idea of taking remote participants off the wall and bringing them into the circle. Regardless of how the Centro performs in the market, I think it is the start of a new way to think about videoconferencing and it could be the start of an entire new market category. While in New York I also got a close look at the latest version of their higher end group systems, the Polycom RealPresence Medialign. While this looks like something that requires a highly trained integrator to build and configure, it actually can be set up with zero tools. Not even a screwdriver is needed, as it has big “thumbscrews” that can be turned by hand. One thing that I like about this product is that it includes a lot of Polycom’s experience enhancing technologies such as NoiseBlock, Acoustic Fence, and EagleEye Producer/Director. I generally think of these kinds of features as price bumping add-ons. It is good to see that Polycom sees them as essential parts of the experience, and not optional extras that can be used to milk a few extra dollars from their customers. Polycom also shared their new Concierge software. People often ask me why enterprise videoconferencing is still needed when we have so many affordable consumer video offerings. One of my top answers is meeting control. An enterprise solution allows meeting IT support to mute people, connect or disconnect people, allow content share, etc. Polycom Concierge takes this power, and gives it directly to the users, allowing meeting hosts to easily control their own meetings, without the help of traditional IT meeting concierge support. Finally, Polycom shared that their VVX series of desktop phones will be the first to support the new cloud voice service which will be a part of Microsoft Office 365. There are definitely advantages to having a close relationship with Microsoft and Polycom’s relationship with them is the envy of the industry. At the end of the day, it was clear why the Polycom team was so excited. Any one of these products would have been an interesting announcement, but all of this at once shows a company fighting for leadership in video collaboration from the boardroom, to the huddle room, to the open floorspace. 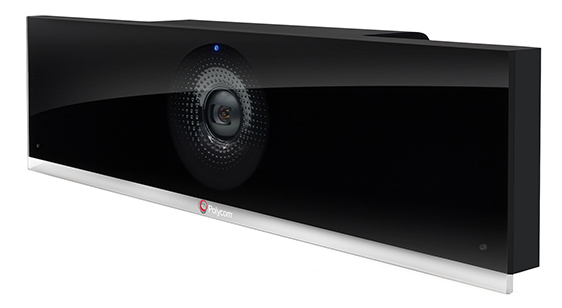 For many years, the videoconferencing market was all about making slight improvements to last year’s camera. With the flood of new market entries, and the countless revolutions in user behavior during the last few years, improvements are no longer enough. In order to lead, companies like Polycom need to be bold, take risks, and embrace new user preferences. Polycom clearly gets this and is looking to lead through innovation. Thanks for the very indepth write up David! Great to hear your thoughts on these pieces, and we can’t wait to try them out ourselves! The Centro is the one i’m personally rather interested in – it’s a rather different take on what we usually see in the marketplace, and from the sounds of it, a much improved “round table” device. One of the issues I have always had with these kind of devices is the “seam”, which you have said is pretty much non-existent in the Centro. It also sounds as though they have really thought about the user perspective – the hiding of the camera when a local meeting is taking place, for example, is something many wouldn’t think about… but for a user who thinks they are being “spied upon by the camera”, features such as this make a real difference to how comfortable people are in the collaborative space. As is probably quite obvious, I can see the Trio being the perfect solution for those many organisations who have the SoundStation as an iconic feature of their meeting room tables. They have definitely done a smart thing here! And for the Debut, i’ll be interested in testing this out & finding out it’s USP’s – as you’ve mentioned, it’s a solution designed for the huddle room. The Group 310 is of course, for a similar room type, and so i’d be interested in your thoughts when positioning one against the other? Hi Emily, thanks for the comments! I can’t wait to hear your thoughts after you get some of these products in your VideoCentric lab. I also see a lot of overlap between the Debut and the Group 310. Polycom even lists them as “related products” on their website. It looks like the Debut has an internal mic and full PTZ, while the Group 310 has optical zoom (not pan or tilt) and a few more in and out ports. I would be very interested to learn what other differences you discover when you get your hands on a Debut.